Take 2 capsules three times daily between meals or as needed. 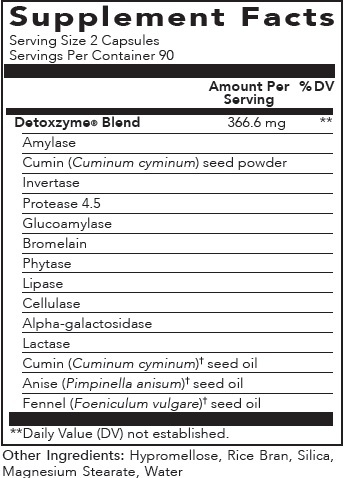 This product may be used in conjunction with a cleansing or detoxifying program. For the relief of occasional symptoms such as fullness, pressure, bloating, gas, pain, and/or minor cramping that may occur after eating. Warning: Do not give this product to children under 12 years of age except under the supervision of a doctor. If symptoms persist, discontinue use of this product and consult your physician. Are You Living With Toxins? The average American home contains dangerous amounts of toxic chemicals. The good news? You can change your home, and we have FREE tips to get you started!